Traveling to Vancouver is half the fun of being here because there are so many interesting ways to arrive in the city. Here are your options. 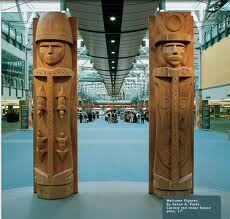 Vancouver has a wonderful, manageable international airport (YVR) consistently voted one of the best in North America. It’s a small airport with remarkable local art and culture, good food, chair massages, duty free shops, souvenir stores. Furthermore, The Fairmont Airport Hotel is located directly above the departures counter. Staying at the Fairmont Airport Hotel the night before you fly offers the ultimate in convenience and stress free travel. There’s no anxiety associated with last minute transportation: traffic jams, bad weather, car problems. And once you reach the hotel, you can print your boarding pass. In the morning, you’ll get a friendly wake up call so there’s no change of missing your flight. Just hop out of bed, get dressed, gather your luggage and walk downstairs. You can drive from the US to Vancouver simply by going north on I5 and crossing the border at the Peace Arch border crossing. From the border, you are about 35 minutes to downtown Vancouver. If you’re already in Canada, just follow Canada’s Highway 1, the world’s longest continuous highway to the end (or nearly the end) and you’ll find yourself in Vancouver. 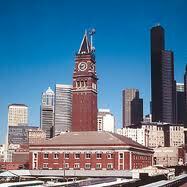 Amtrak operates service between Seattle and Vancouver twice daily, once in the morning and once in the evening. The train trip from Seattle to Vancouver takes about 4 scenic hours and you’ll go through customs once you reach Vancouver. The train is a convenient and civilized way to enter the country. Some Seattle hotels, like the St. Cloud Stadium, offer a free shuttle between the hotel and the Seattle train station (pictured here) and between the train station and the hotel. This hotel also offers a free shuttle between the hotel and the Victoria Clipper dock so you can take Amtrak to Seattle, spend the night in Seattle and then take the Victoria Clipper ferry from Seattle to Victoria. Amtrak also offers one direct train daily from Portland to Vancouver. If you are already in Canada, ViaRail offers train service from the east coast across the country to Vancouver. You can reach Vancouver by train from Halifax, Quebec City (actually Charney) Montreal, Toronto, Winnipeg, Saskatoon, Edmonton and Jasper. Greyhound operates service between Vancouver and most other cities in North America. Surprisingly there is no direct ferry service between Vancouver and Seattle. 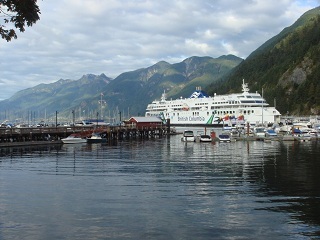 Instead, the Victoria Clipper travels between Seattle and Victoria. From Victoria, you can fly by float plane or take a bus to Swartz Bay ferry terminal and then take the ferry from Swartz Bay to Tsawwassen ferry terminal. From Tsawwassen, the bus will take you to downtown Vancouver. You can travel by cruise ship between Vancouver and Alaska in summer, and between Vancouver and Seattle, San Francisco and San Diego at the end of the season if you are lucky enough to catch one of the repositioning cruises that move cruise ships to warmer waters for the winter. If you are a sailor, you probably already know that Vancouver is surrounded by the Pacific Ocean on three sides and sailing and motoring into and out of Vancouver and the surrounding islands is a favourite pastime for sailors from around the world.